It’s officially summer break. 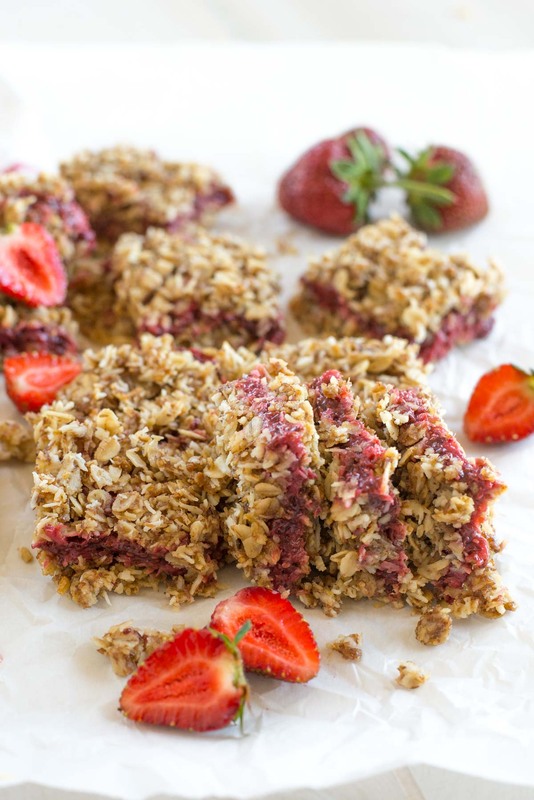 Which means healthy oatmeal bars…. Wait! I really meant to say, the kids are home. All day, every day. Which only means one thing they’re already bored. While I’m very happy that our oldest loves school so much and can’t stand the thought of being at home without anything to do. Or as she would say, “without any friends or fun.” I’m biting my tongue when all I want to do is say, are you crazy?!? Some day the girl is going to live for summer break. I mean seriously, those were the days. Not a care in the world, no job, nothing to worry about but sleeping in, going to the pool and playing. It meant freedom. But like I said, I must feel blessed that she actually likes school enough that she would rather be going year round than have anything to do with being at home all day. What I’m telling myself is that she just loves school THAT much and doesn’t just dread being at home with her awesome mom and dad (please don’t burst my bubble). So now it has begun. Three girls all day, every day means lots of fighting and lots of little hands to feed. I swear the pool makes them extremely hungry in the summer but man, it seems like every five minutes someone else is hungry. I can’t imagine what it’s like to feed three middle school boys. We’ll leave that one for someone else. So to fight the urge to pull my hair out I decided it was time to get real organized this summer, creating a list of healthy breakfast foods, healthy lunch foods and snack options. From that list I created a menu that I can rotate. 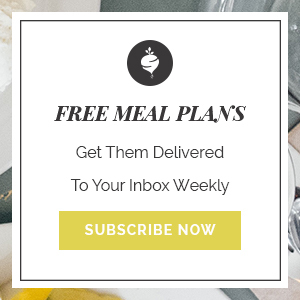 It cuts back on the grocery bill or buying food on the run and ultimately it helps us to stay on track with healthy and filling meals. I love it. Do you want me to share it with you? My priorities have obviously changed over the years but it really is the greatest thing. The grocery list is made, the menu has been created so you no longer have to fret and worry about what you’re going to feed them for breakfast or lunch. And the better news (because it gets better), you no longer have to listen to them complain about eating eggs for the 10th day in a row. Now that I would know what that is like (insert all the sarcasm). So after lists were made I realized I need just a few snack foods that are satisfying, budget friendly (the hubs is cracking down) and easy to make. Not to mention it’s something that the entire family can enjoy on the fly. 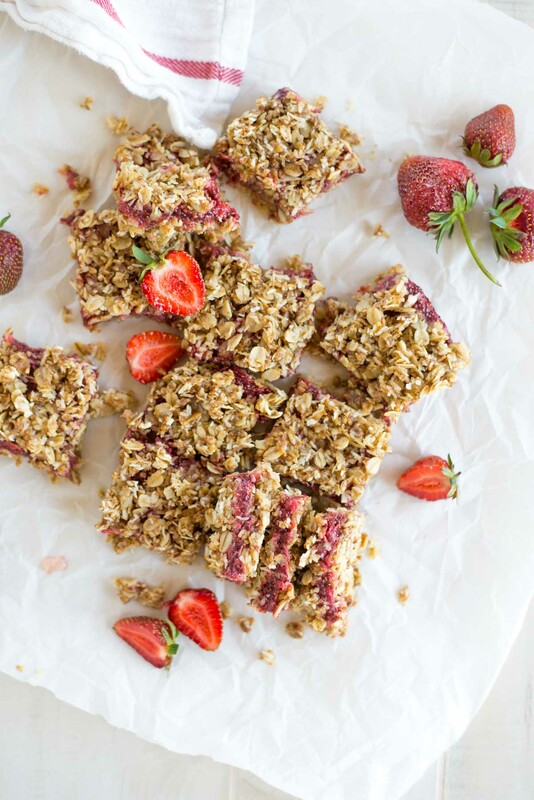 That’s where these strawberry chia stuffed oatmeal bars come in. Chewy, fruity and kid approved with a whole lot of health. They’re filling, nutritious, and satisfying. Plus my kids are raving over them. 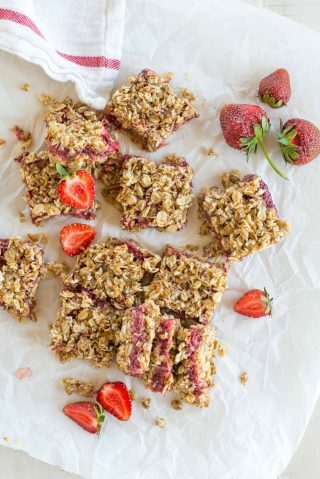 You can make a double or triple batch and freeze them for a quick snack any day of the week. I’d call this a cross between a Nutri-Grain bar and a fig newton (which is my favorite cookie ever). But really, it’s the little things like having a good snack bar, granola or energy ball recipe that make healthy eating so much more enjoyable and simple. The better news, you only have to make them once to find out just how easy they are. Don’t take my word for it but seriously make them for yourself and enjoy all of the goodness. These never disappoint and you need them in your life, like now! A few quick ingredients, one bowl and a saucepan and you are good to go. Plus you can stuff it with anything you desire. Cherry, peaches or even a peanut butter chocolate mixture. I would have made that but my kids would have never gone for anything else. Try it out for yourself! Line a 9x9 inch glass pan with parchment paper. In a saucepan, heat the butter, coconut oil and sugar over medium heat. Whisk until the sugar dissolves. Cook until it's bubbling and let boil for 2 minutes. Remove from heat and stir in the oats, coconut and flax meal. Stir until the oats are completely moistened and set aside. In a small saucepan add hulled strawberries, maple syrup. Cook until beginning to break down and mash with a potato masher. Once starting to boil add chia seeds and stir well. Continue boiling until it forms into a thick syrup or jam like substance. 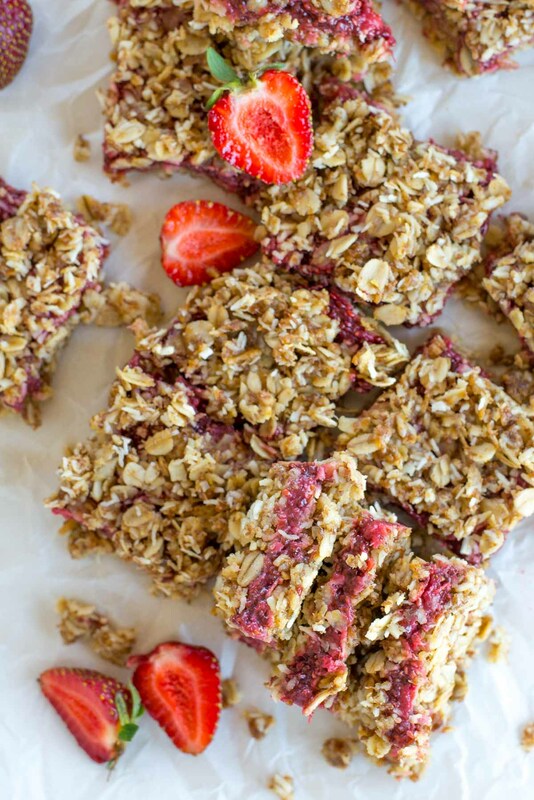 Place ½ of the oat mixture in bottom of 9x9 pan and press into the bottom of the pan. Add the strawberry chia jam and spread over first layer until even. Add the remaining oat mixture to the top and spread evenly, pressing just enough to coat the top. Let cool completely or refrigerate (I like them cold) before slicing.